This modified Tata Sumo is super HOT, and is a 4X4! 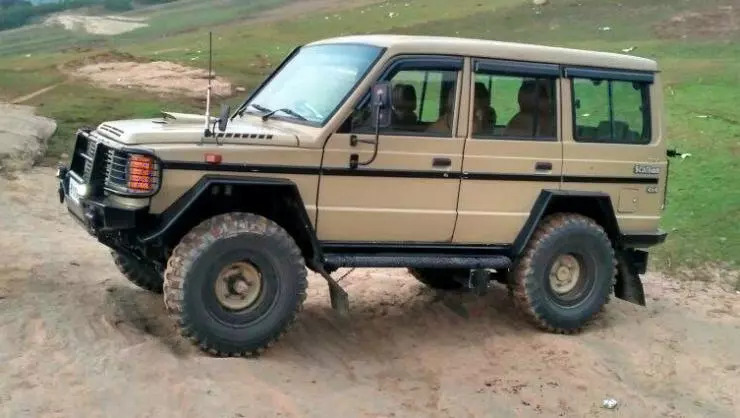 The Tata Sumo is one of India’s oldest MUVs but not many know that Tata Motors builds a very rugged, 4X4 version of this people carrier for the Indian army and other paramilitary forces. One such Sumo 4X4 has been put on a diet of tasteful modifications, and the result is a very butch looking vehicle that dominates proceedings, on and off the road. 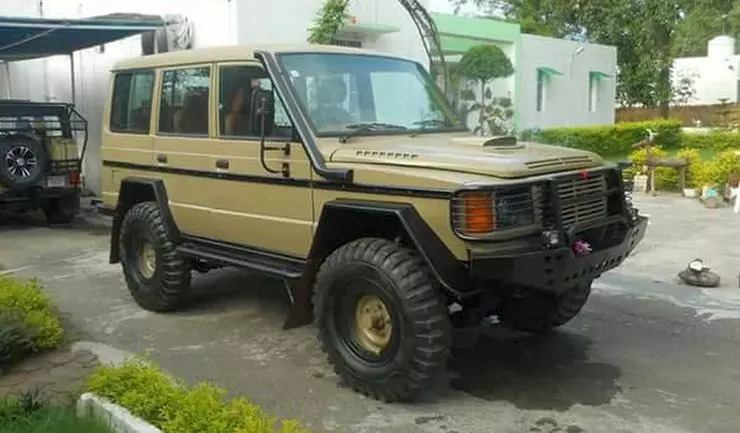 This Sumo 4X4 was built for Mr. Parikshit Singh Deora, who runs the Godwad Safari Camp in Rajasthan. The MUV retains its OE spec 2.0 liter indirect injection turbocharged, intercooled diesel engine with 90 Bhp pf peak power and 190 Nm of peak torque. This engine is mated to a Borg-Warner 4X4 transfer case with an electric shifter, and low and high ratios. Standard suspension, a power steering, air conditioning and independent front suspension make the vehicle liveable as a daily driver. Key modifications include rugged steel bumpers at the front and rear, wider, custom-built wheel arches and massive 33*12.5*15 inch tyres shod on 15 inch alloy wheels. These tyres give the Sumo 4X4 an imposing stance, enough to tower over most other traffic. The large wing mirrors from a Tata truck are nice touches. 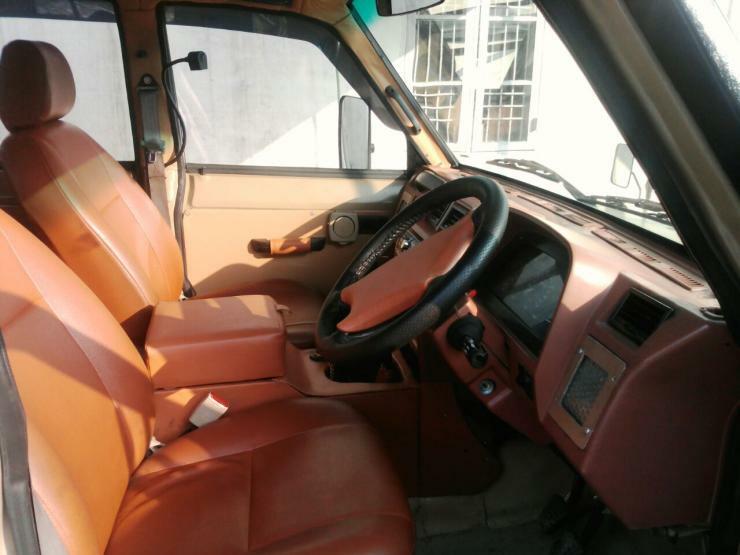 A working snorkel, a 14 liter Tropicool fridge, a 0.5 KVa inverter with a 5 amp power output socket, rock sliders, LED lighting at the front, rear and interiors, and also revamped interiors with leather seating, cup holders, center console and a navigator lamp, are the other modifications. Said to deliver about 9-10 Kmpl, this Sumo 4X4 seems ready to take on cross country expeditions. This vehicle was originally an army-discard, picked up at an auction. Basically, it’s an open canvas that goes on to show what a dedicated enthusiast can do with some imagination and taste. Summing it up. it’s best looking Sumo 4X4 we’ve seen so far in India.